Rev. Dr. Richard B. Gilbert, BCC, Ph.D.
Untimely death of a husband. A long, lousy, difficult dying. Unused medications carelessly left behind. Personal choice vs. the need for hospice care. A depression pushed into a suicide attempt. This is a marvelous book, tough to read yet rich in its insights and encouragement. It also makes it tough to review because it is as much a story that needs to be preserved for the reader as it is a testimony to the depths of rage, despair, hopelessness and healing that come with grief. Terry was widowed at 35 years old, experiencing, in many ways, her own “slow death” as she witnessed the dying and death of her husband. Lou Gehrig’s Disease (ALS). It is ugly, doesn’t discriminate, and slowly follows are tortuous route as it inches its way through the body and the spirit. The struggle was there for them both. Still very young, the marriage was tested as they were forced, painfully so, to learn new ways to trust, share and communicate. Relationships are built on the evolution of boundaries. It is tough to do when the boundaries are erased not by people, but by an awful disease. When do I step in? When do I wait for my husband to decide? Do I call hospice? It is his last decision, last choice or measure of control, yet one might argue that he did not benefit from all of the resources of hospice. The disease forced the destruction of family rituals and pathways with no time to mourn them; you were too busy trying to find your way through yet another crisis. Death. Did you know that flowers offer a different fragrance at funerals than at weddings? True or not, it heightens the awareness of death’s discomfort and the uncomfortableness of the funeral. We are never prepared for the darkness of death and grieving, and certainly not, when it is your spouse, at age 35. The depression had already come. No sleep. No energy to grieve. The horror of it all. It became the common ingredient in life and thus was anticipated as the key ingredient on the menu of sorrow. The medication was her husband’s pills, left behind (carelessly? – wonders the author) by hospice. They tended to the patient, the spouse and the medical equipment—but not the pills. They were there for the observing and the swallowing. Therapy hadn’t worked. She argued that the first therapist wanted the money up front, in cash, and seemed unwilling to bend to meet the client in her story. Maybe she also was unwilling to bend. Lou Gehrig’s Disease, like all diseases, is its own world. It clearly thrusts us (however we are connected to the story) into the severity of chronic illness’ harsh world. Chronicity. We don’t really understand it in medicine. We want things neat and tidy and, if they must be sick, at least a disease that is reasonably “manageable.” It doesn’t really happen that way with chronic illness. Medical tricks of the trade lose their appeal. Medical personnel start backing away. Caregivers who focus on doing tend to visit less frequently. There is so little one can “do” and even less to talk about. Agencies and funding sources often disappear. This is the world of chronic illness for ever so many. 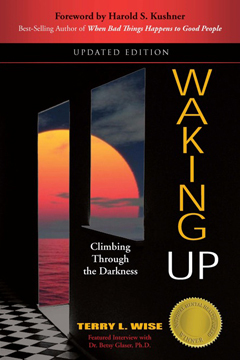 It is its own harsh journey and Lou Gehrig’s Disease, creeping through the body so that you wonder what, if you should wake up in the morning (and do you want to wake up? ), will you have lost for the start of this new day. Terry Wise is a remarkable woman. I have met her and heard her story. Read the book. Visit her on the website. Invite her to your programs and conferences. There is a story here to be told and heard.